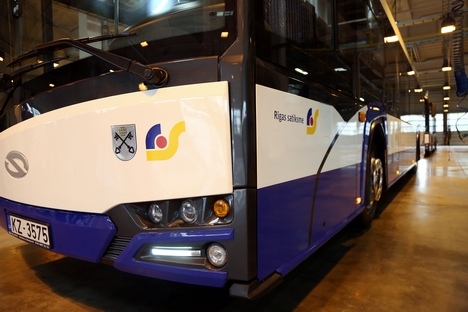 Latvian Saeima’s Public Expenditures and Audit Committee has made a repeated request to Riga Mayor Nils Ušakovs to provide results of the audit performed by Ernst&Young Baltic in public transport company SIA Rīgas satiksme by ten o’clock in the morning of 1 April, as reported by the parliament’s press-service. Committee’s chairman Kaspars Ģirģens from KPV LV says if Riga City Council does not provide requested information, the parliament could form a special investigation committee to secure access to this document. The committee’s chairman stresses that «non-provision of access to the document means disrespecting the committee and Latvia’s residents, who have a right to learn the contents of this document through efforts of the parliamentary committee». «We have given Nils Ušakovs, as the shareholder in the company, time until Monday morning to voluntarily submit the audit report. In the event of failure to provide access, the committee’s head may decide to compose an investigative committee that will have a justifiable reason to request information from law enforcement institutions,» says Ģirģens. Ex-chief of Rīgas satiksme Anrijs Matīss had previously said Ernst&Young report is ‘very critical’ and contains a number of measures the company should perform in order to continue functioning. Recommendations are associated with choice of cooperation partners, self-cost estimates and other processes. At the same time, auditors have said that in the past five years the now former management of the public transport company has caused millions worth of damages. Ir magazine reports that the audit has revealed that, for example, EUR 6 million was overpaid in the fuel procurement with a firm whose owners hide behind offshore companies, the loan allocated for tram procurement was wasted on wages, and the expensive e-talon system maintenance cost 40% of the money earned from ticket sales. Auditors have also uncovered that the EUR 50 million loan provided by SEB Bank on 20 low-floor tram procurement was spent on wages simply because the company had a shortage of funds. This shortage was covered by the temporary board using Riga City Council’s requested grant of EUR 17 million. The money was returned to the bank’s account and so no one can access it now, Matīss told Ir magazine. Approximately EUR 3 million were overpaid in a poor fuel procurement in 2016 and 2017. In November 2015, RS contracted RDZ Energy to ensure fuel supply for five years. Owners of this company hide in Malta and British Virgin Isles, Ir magazine previously reported. Approximately half of this company’s turnover is composed of revenue from RS. On top of that, its true beneficiaries are unknown.